As consumer confidence has risen over the past couple of years, so has the appeal to hold debt. 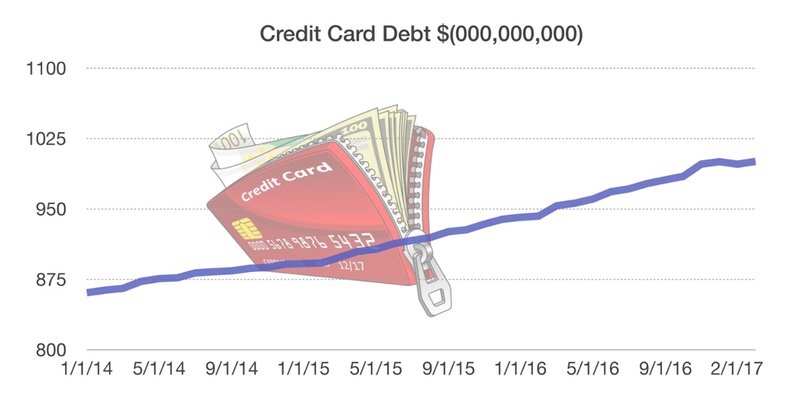 Federal Reserve data shows that U.S. consumers now have over $1 trillion on credit cards alone, up 6.2% from a year ago, and is currently the highest amount of consumer credit card debt since January 2009. The recent data makes credit card debt the third largest consumer lending category in the industry following auto loans and student loans. Two variables that economists look at closely are employment and interest rates, which directly affect the ability for consumers to borrow. Economists believe that loosening underwriting standards in various loan categories along with a strengthening employment market could very well offset any interest rate increases. The credit card business remains among the most profitable in banking as banks can charge much higher interest rates than other loan types, with average credit card rates between 12% and 14%. Yet, as credit card debt levels have risen, so have reserves for losses as banks anticipate delinquencies to rise. Financially savvy consumers that pay their balances down each month avoid hefty interest charges, but those that don’t, known as “revolvers,” pay average rates of between 12% to 14% and significantly more if they are considered higher risk.